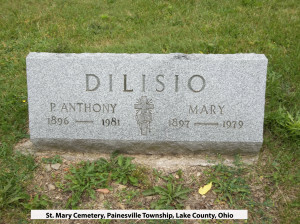 Pietrantonio DiLisio first appears in the Painesville, Ohio, area in 1924. 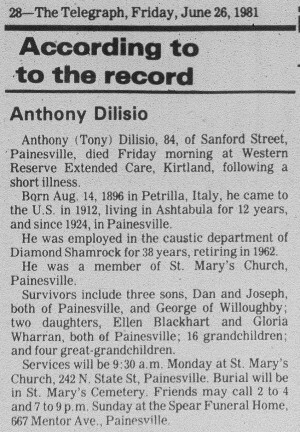 In America, Pietrantonio DiLisio was known as Anthony Dilisio. Pietrantonio DiLisio, son of Giuseppe DiLisio and Maria Steluta, was born on August 14, 1896, at Petrella Tifernina, Italy. He married Maria Bucci, daughter of Antonio Bucci and Teodora Mancini, on February 8, 1919 at Ashtabula County, Ohio. Pietrantonio died on June 26, 1981, at Western Reserve Extended Care, Kirtland, Geauga County, Ohio, at age 84. His body was interred at St. Mary Cemetery at Painesville Township, Lake County, Ohio. Pietrantonio DiLisio, age 16, immigrated to the United States on April 30, 1913, travelling to Cleveland, Cuyahoga County, Ohio. He was joining an uncle. Pietrantonio Dilisio became a citizen of the United States on June 4, 1925. Pietrantonio resided at 344 Sanford Street, Painesville, Lake County, Ohio, when he was naturalized. Mr. DiLisio was employed by the Diamond Alkali Compnay from 1924 until he retired in 1962. At the time of death, Pietrantonio resided at 74 Sanford Street, Painesville, Lake County, Ohio. Pietrantonio DiLisio may have been related to Painesville Italian Mariano DiLisio. 1. Dan Dilisio was born on August 7, 1920, at Kingsville, Ohio. He married Virginia Messina, daughter of Tommaso Messina and Caterina Graziano, on January 26, 1946 at St. Mary Catholic Church, Painesville, Lake County, Ohio. Dan died on January 18, 2012, at TriPoint Medical Center, Concord Township, Lake County, Ohio, at age 91. 2. Gloria A. Dilisio was born on April 23, 1922, at North Kingsville, Ashtabula County, Ohio. She married Robert L. Wharram. Gloria died on August 4, 2006, at LakeEast Hospital, Painesville, Lake County, Ohio, at age 84. 3. Ellen Dilisio was born on October 2, 1923, at Ohio. 4. Joseph Dilisio was born on May 16, 1926, at Painesville, Lake County, Ohio. He married Mildred Tuttle, daughter of Lloyd Tuttle and Marie Marsh, on July 2, 1966 at Ripley, Chautaugua County, New York. Joseph died on April 13, 2002, at Kingman Regional Medical Center, Kingman, Mohave County, Arizona, at age 75. 5. Teresa Dilisio was born on September 30, 1929, at Painesville, Lake County, Ohio. Teresa died on February 26, 1930, at 203 Sanford Street, Painesville, Lake County, Ohio, bronchial pneumonia at age 5 months. Her body was interred at St. Mary Cemetery at Painesville Township, Lake County, Ohio. 6. George Dilisio was born on May 29, 1932, at Ohio.